Many of those who live in high-rise apartment buildings always miss having a garden. We all love plants and gardens as they play a major role in our lives asides the fact that they are aesthetically pleasing, therapeutic, and calming. Though we may not have a garden to enjoy like those who live on the ground floor, it doesn’t mean we can’t have one created one on our small balcony. While a balcony can range from a size that will take only one or two people (with a tight squeeze) to a space large enough to take four, terraces which are much larger than balconies can conveniently take up to more, with some large enough to hold a small party of a dozen or so people. 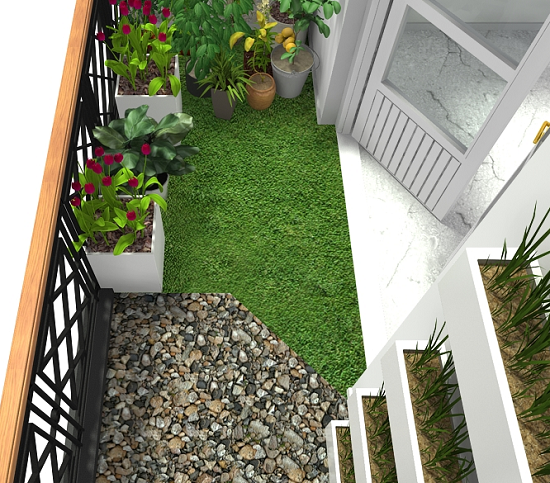 Most of us have balconies though, so, how do you create a small garden on a 10th-floor apartment balcony? And if you are passionate about gardening, how do you intend to enjoy your hobby while living in a small 7th-floor apartment? It’s really not hard and as long as you start with the basics, the floor, wall, and ceiling, you will soon know what you’ll require for each. 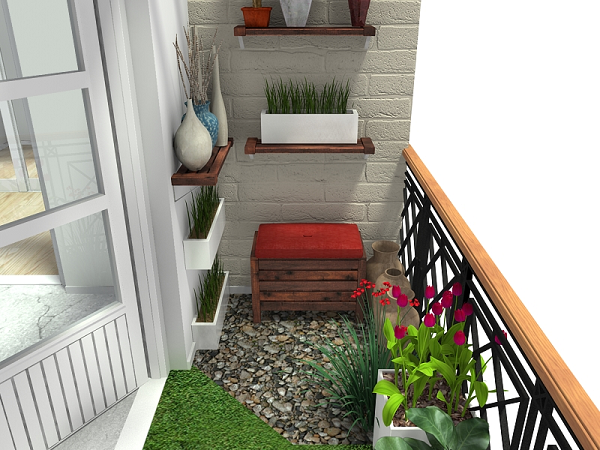 The best way to make a balcony a mini garden is to lay faux grass as its flooring. Forget ceramic tiles or stone flooring. You can find quality faux grass (artificial turf) in the market, online or off, especially at home improvement stores. They look and feel so much like grass, they'll even fool the cows! You can also create a bed of smooth pebbles, using a custom built metal trough not more than 10cm (4inches) deep. 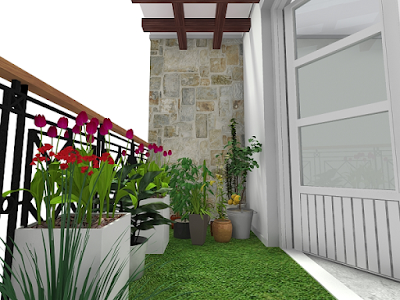 This feature, combined with the faux grass flooring will make your balcony seem like a mini-garden. What great ways to create a garden feel than by mounting simple trellises on external walls on the balcony? A trellis is great for vines and creeping plants that flower. For a simple trellis, go for those made with light wood, bamboo, or slim metal bars. You can also finish one wall with stones or bricks. There are ceramic tiles that look and feel like stone, and they come affordable. Apply this for a rustic feel that is typical of many gardens. Bricks will also look great when applied on a wall and painted any colour you desire. Alternatively, you can fix slim shelves onto a wall and place a collection of ornamental small potted plants like cacti, aloe, asparagus ferns, staghorn ferns, and Chinese money plants. You can also use the shelves to display your growing herbs or vegetables. The shelf sizes and numbers will be dependent on the available wall space, but something long and narrow along the wall can be used to showcase a beautiful range of plants. Keeping the width narrow allows them to sit within the space instead of dominating the small area. Arrange the plants in such a way that hanging plants are at the bottom, and those with more height are kept along the top, to softly frame the feature. With the balcony ceiling, it depends on whether the balcony is open to the skies or covered with the floor slab of another level above. Any which way, you can still create a dramatic ceiling in your little outdoor space. It only requires a little imagination as there are no hard and fast rules on what works and what doesn’t. For the open ceiling, you’ll need to shade your balcony. You can do this by building a pergola or awning structure with wood beams left in their natural form, or painted white. You can hang potted plants from it or train vines to grow over it. And because your balcony is small, it won’t cost you much. For the overhead concrete ceiling, install hooks for a collection of hanging plants in pots or baskets. 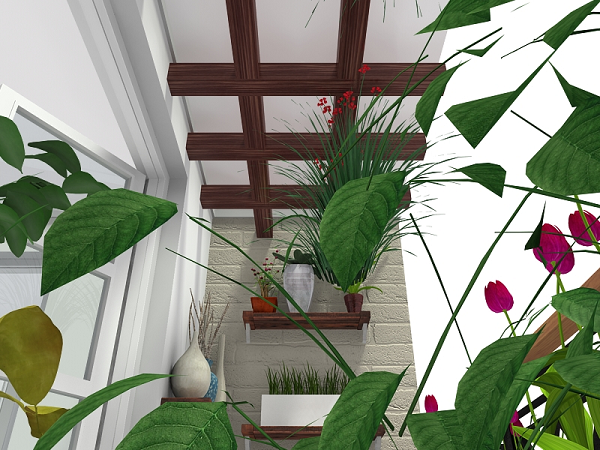 Hanging plants is one of the most visually impactful ways to decorate a small balcony ceiling. Balconies have the greatest impact as an extension of the indoors but for small balconies, your goal should be to bring the outdoors indoors, especially if there is barely any room to sit out with a cup of coffee and a book. If this is the case, set a couple of small wicker chairs (and table) or simple wrought iron chairs by the entrance leading to the balcony. For those lucky to have larger balconies, you may have enough space to seat a couple of people within your balcony space. Visually, foliage beyond any room makes an impactful connection with the outdoors and will make the adjoining indoor space seem larger. So, even if you only have a tiny balcony, it will be worth your effort to create beautiful greenery out there, as it will provide a focal point beyond the boundaries of your interior walls. Who Should you Hire for your Landscape Design?